Allergens: Contains soy, milk ingredients. 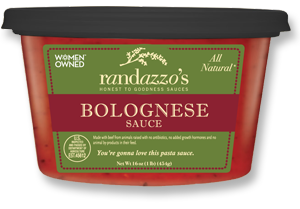 Created from a classic, old-fashioned Italian family recipe, this hearty sauce contains USDA Certified All Natural Beef from cows raised under humane and sustainable farming methods – never given hormones or antibiotics and fed a vegetarian diet. It’s thick, rich texture comes from sweet plum tomatoes from the Garden State. Our Bolognese Pasta Sauce is great with any pasta dish and perfect for an Italian bread pizza topped with provolone.